A rich, homestyle creation that will have you coming back again and again. Creamy bèchamel, a hint of toasted nutmeg, nutty Parmigiano Reggiano, and a salty-acidic bite of caper. Melt butter over medium heat in a large saute pan. Once melted, add the flour, stir until combined to make a roux, and simmer until it becomes sandy in color. In a separate saucepan warm the milk but don’t allow it to boil. Once the milk is warmed begin slowly adding it to the roux, bring to a boil and simmer for 10 minutes, continuously stirring. Next, add the dash of nutmeg, and the cheese, continue stirring until the cheese melts. If the sauce becomes too thick, just add more milk. The trick is to constantly stir! Once combined add in the capers, black pepper and salt to taste. Meanwhile bring a large pot of water to boil, add a generous amount of salt and cook the pasta until al dente. Once the pasta is cooked add it to the Caper Cream Sauce and gently toss until combined. Add a generous amount of freshly grated black pepper, garnish with hot pepper and olive oil if desired and serve. 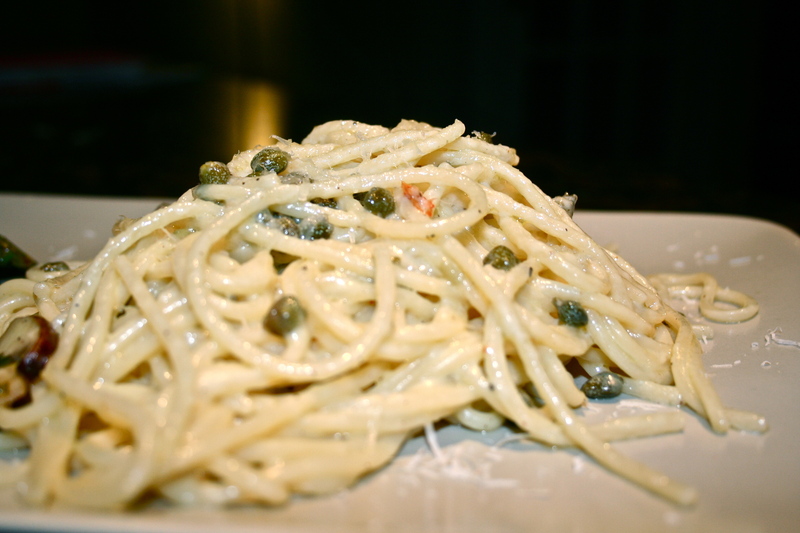 Posted on December 16, 2013 October 31, 2017 by Table Without BordersPosted in RecipesTagged Caper Cream Sauce, Capers, michelle swift, Parmigiano Reggiano, Spaghetti. me tummy want now!! !…lead me to sweet grocery store, to get quality ingredients….now! Fantastic idea for tonight’s meal! Thank you, Michelle!